Normally, I turn away from reports about Africa’s famine and atrocities that too frequently make headlines and overshadow the continent’s bright spots. The news always seems too terrible, far away, incomprehensible and intractable to try to follow and care—until now. 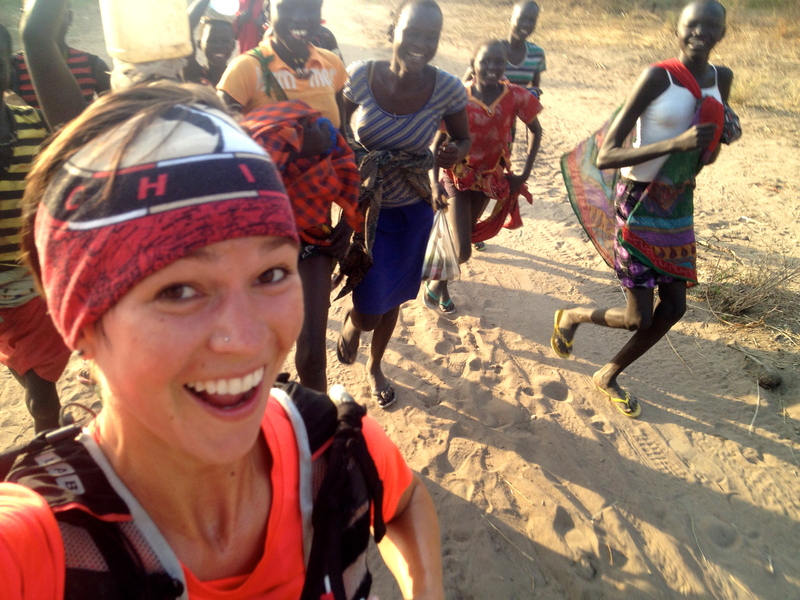 I’m following with great concern the news of killings and starvation unfolding in South Sudan because an ultrarunner I became friends with and consider a hero is working in the thick of the crisis there. Her news updates and photos, which she posts on her Facebook page and blog, make me care not just about her safety, but also about the individuals she portrays. 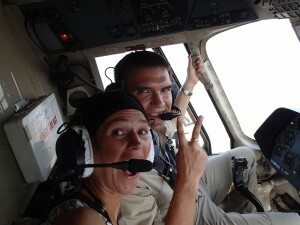 Stephanie Case, who’s 31 and from Canada, is working for the International Rescue Committee in South Sudan. I’m transfixed by her updates of the situation there, and inspired by her courage to do everything she can to help protect and stabilize the displaced population. Africa’s newest country, which gained independence from Sudan in mid-2011, is at a tipping point of violence and a massive food crisis, and hundreds of civilians, along with some aid workers, are being attacked and killed. I met Stephanie in September 2012, when we shared a tent in the Grand to Grand Ultra. An attorney specializing in international human rights, she’s also an experienced, top-level runner at 100-milers and stage races, having run and won several 250K (155 mile) self-supported desert stage races, and winning the Vermont 100 in 2009. She trained for the Grand to Grand by running laps in a military compound in Kabul, where she worked for the UN until March of 2013. Her global adventures as a humanitarian worker and ultrarunner continued after the Grand to Grand Ultra, taking her from Afghanistan to Kyrgyzstan. In between travel and work, she trained for last year’s 100-mile Ultra Trail du Mont Blanc and finished 11th female in a very large, highly competitive international field. She also touched down briefly in Hong Kong in January and, at the last minute, ran the Vibram Hong Kong 100K under her friend’s bib, since her friend who had registered couldn’t run it. Stephanie placed 3rd but, understandably, was DQ’ed for not properly registering. 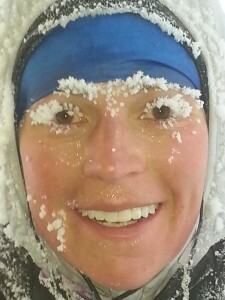 Then, just last February, she ran and won the 230K (143 mile) Ice Ultra through Arctic Sweden. 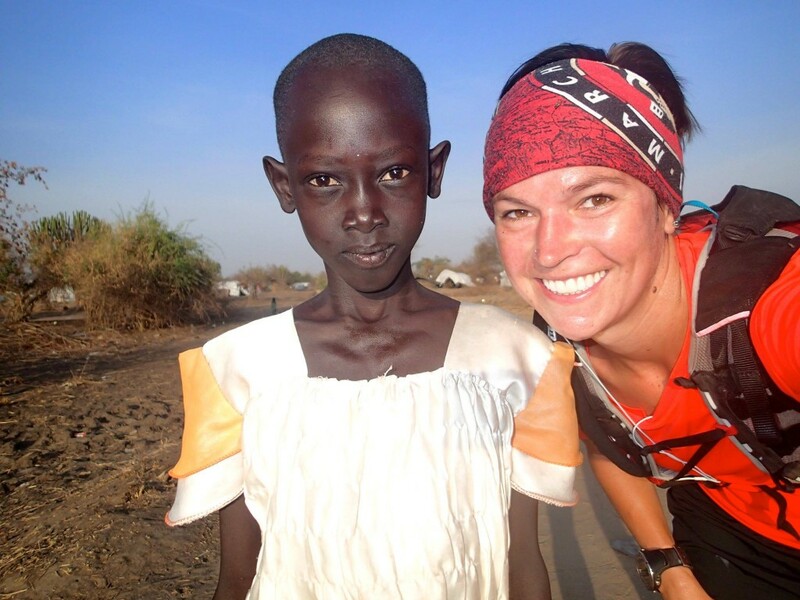 She moved to a village in South Sudan shortly after the Ice Ultra. I did a Q&A with Stephanie via email last weekend, to find out more about her work, her living conditions and her running. 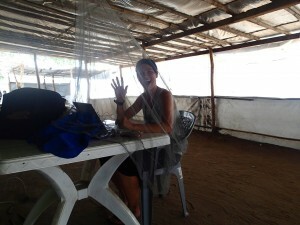 She wrote from her “office,” which is a tent with a solar-powered Internet connection and a mosquito net rigged up over her laptop. Sarah: What is your role in South Sudan? Stephanie: I’m currently working as an Emergency Protection Manager for an NGO,International Rescue Committee, that assists refugees and internally displaced persons (IDPs). I live in a village called Mingkaman, which is approximately 50 minutes by air from the capital, Juba. 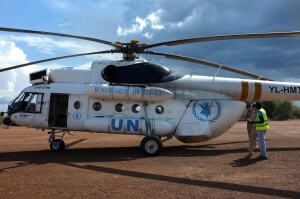 I can only get in and out of my field site by UN helicopter. If I have to travel by road, I must go within a convoy due to security concerns. In a few weeks, my area will be completely inaccessible by road due to heavy rains. Mingkaman has the highest concentration of IDPs of anywhere in the country. With the rains coming, over 50,000 IDPs will be flooded out. We as humanitarian actors have planned to prepare new sites just a few kilometers away where the IDPs may move to, but the funding has not come through. If these new sites are not ready in time, the latrines will overflow and the possibility of a cholera outbreak is very likely. Most IDPs don’t even have plastic sheeting for shelter at this stage, placing them in an extremely precarious state. If displacement continues through this year, people will not be able to plant their crops as usual, which will deepen the food crisis in the years to come. 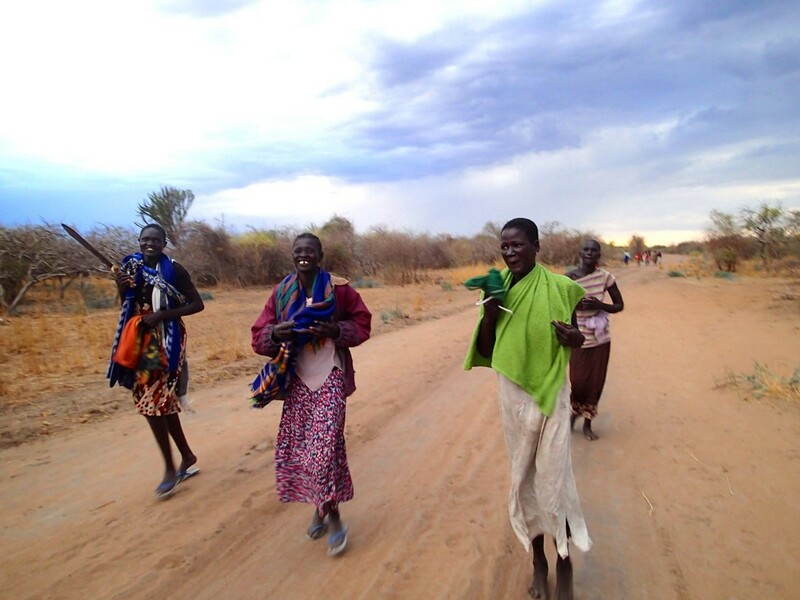 Up to 7 million South Sudanese are at risk of severe food insecurity in 2014-2015. On a typical day, I’m usually awakened around 4 or 5 a.m. by the local pastor, who walks up and down the dirt path in the dark preaching and singing songs to those who are displaced. I’m sure he provides comfort to many, but I wish he would do it at a different hour! Then the rooster starts crowing shortly thereafter. Despite the early rise, this is one of my favourite times of day because things are still, calm and dark, which gives me a few moments of peace. As soon as it gets light enough—around 6:30 am—I head out of the bamboo-fenced compound to begin my morning run to the helipad and back. My run takes me through the IDP site, past families sleeping under trees and inside makeshift plastic shelters. When the kids see my glowing white legs coming down the path, they immediately yell out “Kawadja!” (“white person” or “foreigner” in the local language), which acts as a wake-up call to the rest of the community. My staff arrives between 8 and 8:30, and I give them their tasks for the day. Six of them are IDPs themselves, so I have to monitor their well-being carefully. If it has been a rainy night, I usually don’t give them a hard time for showing up late. They are sent out to assist with food distribution, conduct focus group discussions with communities, disseminate information and other tasks. During the day, I usually run between meetings with other humanitarian actors, monitor my staff in the field, follow up on specific cases and communicate with HQ in Juba. The days are long—often 12+ hours—and I work seven days a week. There is so much work to do that it is hard to justify taking time off, especially when living in the midst of such immense need. Tell us more about your running routine. How far do you go, and how do you minimize risks to your safety? On weekday mornings, I try to run to the helipad and back, which is only approximately 9 km (5.6 miles) roundtrip. My pace is slow, as the kids are starting to run a few kilometers with me now each morning, so it takes just under an hour. I can’t go for longer runs during the week or there will be no water left for my bucket shower by the time I get back to the compound (always a fight for water)! On the weekends, I try to go for longer runs, but the farthest I’ve gone is only about 25 km (15.5 miles) roundtrip. Temperatures reach about 40C (104F) here, so it just gets too hot to run after about 10 or 11 a.m. I generally feel safe, but you never know—there are a lot of guns around camp, and in situations like this, people can be unpredictable. I try not to go too far away. Without a mobile network, I would have no way of contacting anyone for help if I got in trouble. I try to listen to my gut—if something doesn’t feel right, I turn around and head back. It is easy to get freaked out being in such a remote location. Keeping with a regular running routine, even if it is of poor quality, is essential, though, to maintain my sanity. The few minutes I get out in the bush, away from the “kawadja” cheers and the screaming kids, is the only time of day when I get a bit of personal time to myself. It helps me unwind and take a step back. Strangely, running laps around the helipad in the bush often calms me down as it reminds me of the days and weeks I spent running laps around the helipad in my armed compound in Kabul. I get a sense of peace in this familiar routine, even in the strangest of places. During the past two weeks, rebels have killed hundreds of civilians and attacked a UN compound (see news report). How do you cope with that news and with the risks to your security? 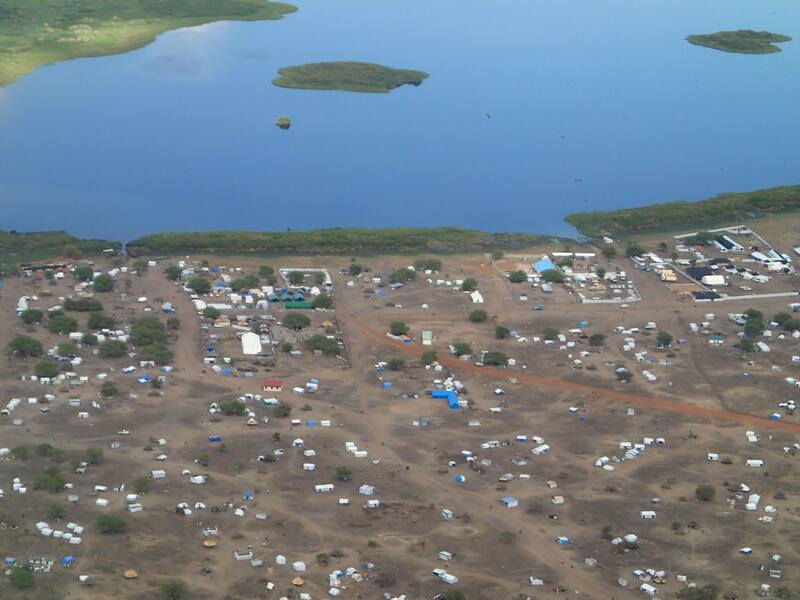 I lost two colleagues in the attack on Bor, which occurred the same week as a major massacre in Bentiu. 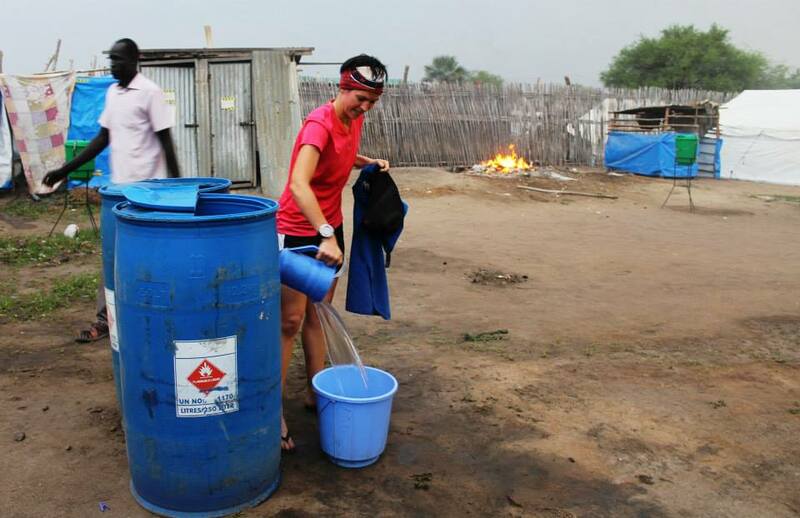 It hasn’t been a great time here in South Sudan, to say the least. When incidents like this happen, it is always hard to process. If you can’t actually hear the gunshots, it can be easy to block it out and assume you aren’t affected. However, from my experience working in Afghanistan, I know how quickly the situation can change. In many ways, I am much safer than I was when I was living in Kabul. I can leave the compound freely during daylight hours, and I don’t feel unsafe when walking around camp. At the same time, I have much less support here in terms of security. I am surrounded only by a bamboo fence, but so far the biggest threat has been looting by people jumping over the fence in the night. If anything serious were to happen, I would have very little protection. Evacuation by helicopter would be the only way out. I take comfort in the fact that we are not in a strategic location here, but as I am in a site that is likely 100 percent Dinka ethnicity (which is the same as the government), we are potentially vulnerable to attach by the rebels (who are of Nuer ethnicity). How long do you plan to stay there? I was brought in on an emergency assignment to assist the individuals and families displaced by the violence in Jonglei State in December, who fled to this area throughout December, January and February. Mingkaman originally had a population of about 7000 people. Now, it is home to 90,000 individuals, with another 16,000 temporarily living on islands in the Nile. My organization intends for me to stay for a year—until February 2015—but the situation is fluid. 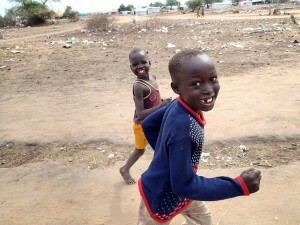 I hope to stay in South Sudan six months, and then I will re-evaluate my energy and stress levels. This is an intense placement, and I would prefer to do a great job over six months rather than an “okay” job over 12 months. What are your living conditions like—your shelter, meals, access to electricity—and who are you living with? I started off living in a small one-person tent sandwiched next to about 15 others in a small compound fenced by bamboo. We live right in the middle of the IDP site with displaced persons living right outside the bamboo walls. The tents were not waterproof, so when the rains started coming, it was a scramble to remove things from the tent into the “offices,” which consists of a large corrugated metal shed. Luckily, we now have three large waterproof tents in which my individual tent now sits. I am the only “kawadja” (white foreigner) in my compound and live with three of the national staff members whom I manage, which can make it difficult to shut off. There is no such thing as “personal” time here. While cultural differences can be exciting and interesting, they also can be exhausting. I live on a diet of rice and beans twice a day, but I have the option to eat things like “ugali” and “wali wali” if I so choose! (So far I have avoided the unappetizing-looking white paste, which is popular in many African countries.) We have electricity only certain hours a day, run off a generator, but Internet has just recently become available 24/7 thanks to some solar panels. It isn’t a great connection, but it is pretty miraculous to think that I can stay connected to everyone while living in the African bush! There is virtually no mobile network, so all important communication has to be done face-to-face or by satellite phone. Are you thinking at all about training for ultras now, or are your race plans on hold? I was originally signed up this year to do the Tarawera 100K in March and UTMF (Ultra Trail Mt. Fuji) in April. However, as soon as I accepted the job in South Sudan, I knew I would have to pull out. I only get a break from here once every three months, and while I can still run, my training is minimal. Due to the stressful conditions and poor nutrition, my energy levels are low, so I fear I wouldn’t be able to get through a major ultra at this moment. I hope to be able to sign up again for UTMF and complete some other races in the Ultra Trail World Series next year. Which do you prefer more: 100-milers, or stage races of around 250K over several days? The 100-miler is still my favourite distance. 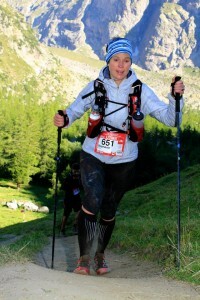 I think of my performance in UTMB last year (race report) as the race of my life. I enjoy stage races immensely for the camaraderie, friendship and variety. However, in terms of a physical and mental challenge, nothing beats a really gnarly 100 miler. 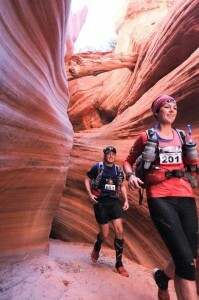 You’ve done stage races in both the extreme cold and snow, and extreme heat and sand. Which is more challenging and why? For me, extreme cold and snow is a much greater challenge. I avoided doing an ice race for years because I hate being cold so much! I found running in extreme cold to be quite stressful as you have to be so careful with your time. In the heat, you are in danger of exhaustion and dehydration, but if you monitor yourself and your water levels well, you can manage the risks. In the cold, if something goes wrong, you simply can’t sit down and sort it out or wait for help—you will freeze. You have to be meticulous with your planning and with your time. Every checkpoint has to be thought out ahead of time so that you make use of every second that your hands are out of your gloves or your body isn’t moving. And dehydration is still a major factor, even in colder climates. 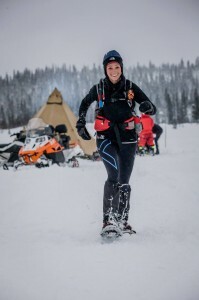 One competitor had to be evacuated out of the Ice Ultra with dehydration and hypothermia. OK, let’s switch from talking about bucket-list ultras back to the extremely harsh reality you’re now in. What’s going on in South Sudan is disturbingly reminiscent of the genocide in Rwanda. It’s easy for us here in North America to shut our eyes and turn away from the news. What do you want people who are so far removed from South Sudan to know about that new country and what’s going on? The good news is that there is much more attention on South Sudan than there ever has been in the past. I shook my head in disbelief when one of my staff members told me how he survived for three years during the previous major catastrophe in South Sudan in the early ’90s by eating leaves from trees. Back then, there was no international presence and no one cared. Now, at least South Sudan is making the news. However, the bad news is that no progress is being made on the ground—in fact, the situation is noticeably deteriorating. South Sudan might be making the news, but the money isn’t coming through from donors, which is hindering our (the humanitarian actors’) ability to provide life-saving assistance. 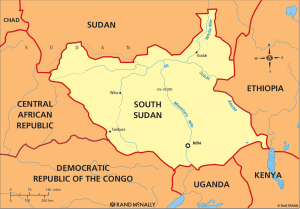 Conflicts in other countries such as Syria and the Central African Republic are somewhat overshadowing the events here in South Sudan. The peace talks have stalled, and the so-called ceasefire agreement is just a piece of paper at this stage. There is a real risk that if progress isn’t made, then we are heading into a long-term conflict, which will have catastrophic implications for the South Sudanese population. The international community had a strong hand in helping South Sudan become independent—we cannot abandon the country now that it is struggling to solidify as a democratic, peaceful nation. The longer the conflict goes on without a political resolution, the higher tensions will rise and the worse the situation will get. Almost a million people have been displaced by the conflict, which will have a negative ripple effect on the economy, food security and many other aspects of life. Some have predicted that next year South Sudan will face the world’s worst food crisis since Ethiopia in the 1980s if the issue isn’t addressed. We—the international community—were overly naive prior to the outbreak of violence in December 2013. We were eager for South Sudan to succeed as an independent country and ignored the signs that it was heading into dangerous territory. Now, it is clear where things are heading without significant intervention and progress made on the political level. There have been gross human rights violations committed by both sides, and a clear disregard for human life. Hospitals have been attacked, civilians have been targeted, and hate speech has been used over the radio to instigate violence. We can no longer ignore what is happening. Finally, tell us about your plans to launch an NGO to promote women’s running in developing countries. It has been a dream of mine to one day start an organization that would combine my passion for women’s rights and outdoor adventure. I can still hardly believe that this dream is becoming a reality! The mission of the organization, Free to Run, is to use running, physical fitness and outdoor adventure as a means of empowering and educating females in disadvantaged communities to overcome the harmful effects of gender, religious and ethnic discrimination. Within the first year, we will be focusing on running events for women and girls in conflict and post-conflict countries through local partners in order to keep costs low and develop relationships. In our second year, we will look at expanding upon these initial projects by establishing a more permanent presence in these countries, creating longer-term sports programs and safe spaces for girls to engage in physical activities. I have seen first-hand the power of sports to effect positive change—both within oneself and one’s community—and I’m eager to create and support opportunities for outdoor adventure for those who may not have had a chance to experience it themselves. When Stephanie establishes an online fundraising campaign for Free to Run, I’ll update this post with that link and also link to her website. Meanwhile, you can email Stephanie if you are interested in supporting her efforts to establish her organization.